The March 7 elections in Iraq remain a topic of interest around the world as both former Prime Minister Iyad Allawi and current Prime Minister Nouri Maliki scramble to create coalitions that would give them a 163-seat majority in parliament. As many feared, violence has marred post-election Iraq with deadly attacks on Iraqi civilians and foreign embassies in and around Baghdad. In addition, Maliki, who received two seats fewer than Allawi, is calling for a recount, claiming voter fraud. In this context it is perhaps difficult to see that this election has in fact revealed a maturation of the political process in Iraq, particularly at the grassroots level. The 2010 elections have been described by thousands of national and international observers affiliated with the United Nations, European Commission and many Iraqi non-governmental organizations (NGOs) as successful and transparent, a possible model for other states in the region. Despite activities by certain political entities promoting their parties near polling centers, and a number of names missing from the voting registration lists, the election was largely touted as free and fair overall. 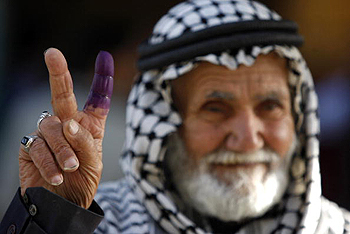 Even with ongoing violence perpetrated by al Qaeda and other militant groups, voter participation exceeded expectations with 62 percent of the 19 million eligible voters venturing out to cast their votes, according to estimates by Iraq's Independent High Electoral Commission (IHEC). The Iraqi security forces provided election security that allowed Iraqis, some for the first time, to go to polling centers unencumbered by curfews and other security obstacles and improved citizen confidence in the Iraqi security forces. In my province of Dhi Qar in southern Iraq, for example, nearly 61 percent of eligible voters came out: a strong showing compared with less than 50 percent during federal and provincial elections in 2005. Results also show that provinces with large Sunni populations sometimes voted disproportionately for Shi'ite candidates and vice versa, suggesting that there was less voting along sectarian or religious lines in this election compared with the previous one. This is an encouraging sign and suggests that there has been a change in people's voting trends, with parties running on secular-leaning platforms receiving more votes than in previous elections. In the largely Shi'ite Dhi Qar province, for example, the State of Law Party, led by al-Maliki and a coalition of Sunni and independent politicians, was in the lead for some time, with the religious Shi'ite Iraqi National Alliance and Allawi's liberal cross-sectarian coalition, Al Iraqiyah, also receiving a considerable number of votes. The success of the elections in provinces like Dhi Qar is due in part to groups like the Dhi Qar Forum, an organization for civil society development, which provided pre-election outreach and education to voters in the region. The Dhi Qar Forum, in cooperation with the Dhi Qar Provincial Reconstruction Team—which is organized by the Italian and American governments but based in Dhi Qar—provided 40 election monitors in 75 percent of polling stations across the district. In a recent report, the Dhi Qar Forum reported that the IHEC, the exclusive electoral authority in Iraq, conducted itself professionally, reporting only a few minor violations, mainly due to voters that had not updated their registration information. NGOs like the Dhi Qar Forum provided venues for communities—especially women and underprivileged voters—to discuss and better understand their rights as citizens, through U.N.-funded programs and awareness campaigns. The United Nations, the National Democratic Institute, and the U.S. Provincial Reconstruction Teams, which empower local governments to govern more effectively, instituted efforts to promote citizenship participation. Still, more work and efforts are required to instill a culture of democracy and human rights. Workshops, conferences and trainings continue to be important tools for reaching grassroots citizens in Iraq, as well as advocacy campaigns highlighting tolerance and coexistence. The renewed violence—which most people believe is perpetrated by al Qaeda to fuel sectarian violence and undermine the political process and Iraq's nascent government—will hopefully spur Iraqi politicians to cooperate in forming a government based on agreed constitutional procedures. The Iraqi people have demonstrated that they desire change, and both the local government and the international community should listen to and cultivate this desire, empowering civil society to support government efforts to strengthen the rule of law and the independence of the judiciary system in Iraq. Ahmed Kadhum Fahad is executive manager of the Dhi Qar Forum for civil society development. This article was written for the Common Ground News Service: www.commongroundnews.org.